I was introduced to Eatzi’s in Denver by my good friend who visited me from South Dakota. I had past it several times and had dismissed it as an Italian restaurant. I was totally wrong! Eatzi’s is like this glorious grown up, gourmet, college food court. If you love food, but hate to cook. You will LOVE Eatzi’s. 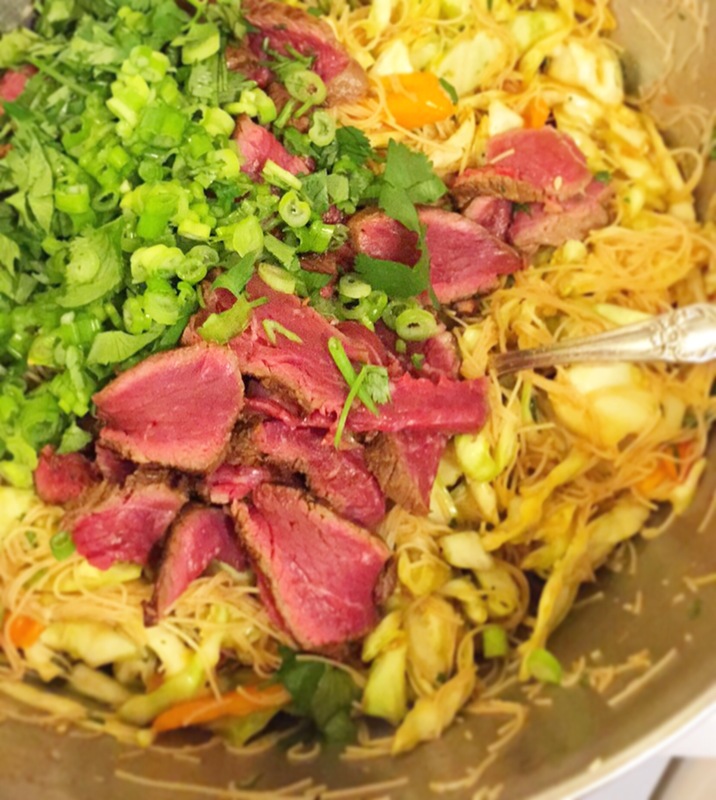 Another friend recommended that I try their Thai Beef Salad. It looks unassuming but it is absolutely delicious. The ingredient list is long, but it’s completely necessary. All the fresh herbs and umami seasonings make this one of the best salads I’ve had. I could not find a recipe for it online, so I made my own. This makes the perfect lunch or main-dish dinner salad. 1 plastic container or ½ cup fresh basil- chopped- Use Thai basil if you can find it. *If you can’t find fresh lemongrass (it would be in the fresh herbs sections). Don’t worry. There is lemongrass in the red curry paste, so you’ll still get that flavor. Also, all of these ingredients are easily found in any grocery store. Lemongrass is probably the only one that may be hard to find. In a small bowl, mix together the lime juice through red curry paste. Mix very well. Pour the sauce over the cabbage and mix very well. Add the veggies and herbs, mix. Very, very thinly sliced the steak. Add that and the rice noodles to the salad. Mix together. Let sit for 10 minutes. Taste and adjust seasonings. If it’s not salty enough, add a little more soy sauce or salt. If it’s too salty, add a little more rice wine. Store in the fridge. It’s good for about 2-3 more days. My husband was given some carrots from Pachamama Farm, in Longmont, Colorado. 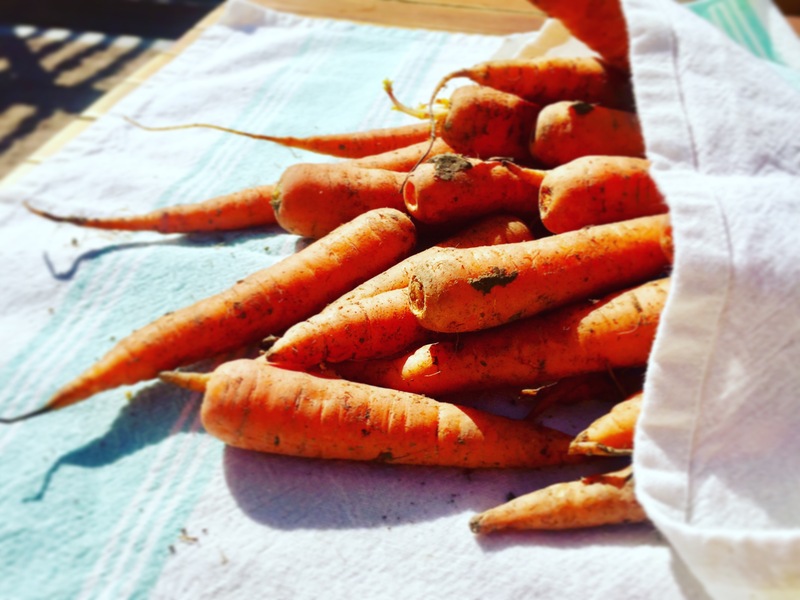 These carrots had grown all winter and were delicious and sweet. I love roasted carrots, but since these carrots were so fresh and flavorful on their own, I wanted to create a dish using them raw. Growing up, we always had grated carrot in our salads. I enjoyed this much more than chunks. It was a way to give their flavor in a more delicate package. In French cuisine, shredded carrot salad is a classic and I always love to refer to it to make good use out of my carrots. For this recipe, I’m using long ribbons of carrots that are created using your vegetable peeler. It’s like you’re peeling the skin and then you just keep on peeling! If you’re using organic carrots, just scrub them clean and use the whole carrot. If not, then peel away the outer skin and then start saving the rest. 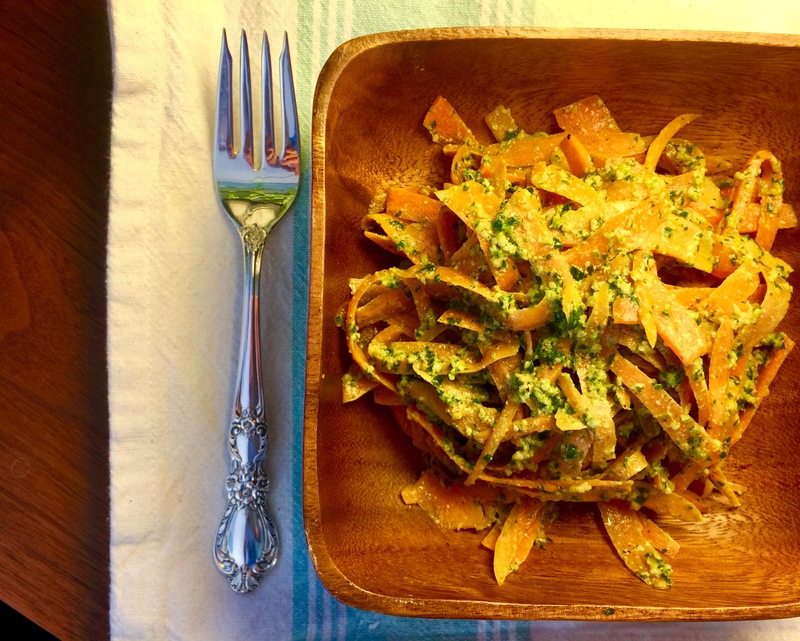 I mixed the carrot ribbons with cilantro pesto. Cilantro pesto is very easy to make and makes good use of the rest of your cilantro after you bought a bunch for a recipe that calls for 2 tablespoons. Using a vegetable peeler, peel long ribbons off of the carrot into a bowl. Put the cashews in a pan over medium heat. Shake them up quite a bit in the pan and heat until they are fragrant. Put the cilantro into a food processor and pulse a few times. Add the garlic, lemon juice, red pepper flakes if using, and some salt and pepper to the food processor. Pulse until well combined. Now, start pulsing in the olive oil very slowly until everything is mixed together. Taste it. Probably needs more salt! Add more and pulse, pulse, pulse. Add as much of the pesto as you like to the bowl of carrot ribbons and mix together. Bon appétite!